One of the first and most successful artists to make the transition from jazz to rock, Joe Morris became a cornerstone of Atlantic Records during their first half dozen years in operation, helping to give the fledging label artistic credibility as well as commercial solvency. Morris was the middle child of musical siblings, his brothers playing guitar and saxophone respectively for some quality jazz outfits. 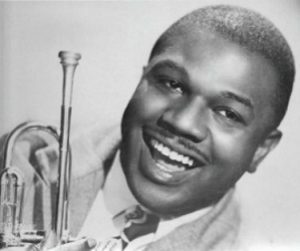 Joe began in jazz himself, the most successful of all the Morris brothers in that field no less, as trumpeter in Lionel Hampton’s band. But upon being coaxed to leave by Hamp’s sax player, Johnny Griffin, to start their own group, Morris laid down both jazz and rock styled songs and when it was the rockers that made the most noise out of the gate his course was set. His original band featuring Griffin, who became one of the defining early rock saxophonists before eventually returning to the jazz field where his heart truly was, and guitarist George Freeman, another whose groundbreaking rock work quickly gave way to his desire to play jazz, was one of the tightest of the day. Though only together for two years their sides helped shape the course of rock instrumentals going forward. Morris was a somewhat reluctant – though reasonably effective – vocalist but upon the turnover in his outfit he decided to follow the lead of Johnny Otis, who’d put together a large versatile ensemble with different singers to tour as a self-contained multi-act revue, and to that end Morris hired Billy Mitchell and Laurie Tate as singers as well as backing them in the studio. It was with Tate on lead that he scored his first chart topper in 1950 but when Tate left to start a family in 1951 Morris brought in Faye Scruggs, soon to be re-named Faye Adams, with whom he scored his biggest hits upon leaving Atlantic Records for Herald, three Number Ones over a two year span. His male vocalist at this time was Al Savage who Morris scored a Top Three hit with at the same time and the Joe Morris Cavalcade was sitting pretty at the top of the field mid-decade. But defections and disputes after the hits started rolling in curtailed Morris’s momentum and following a return to Atlantic Records he was felled by a cerebral hemorrhage in 1958 at just 36 years old. As sideman… behind Wynonie Harris.